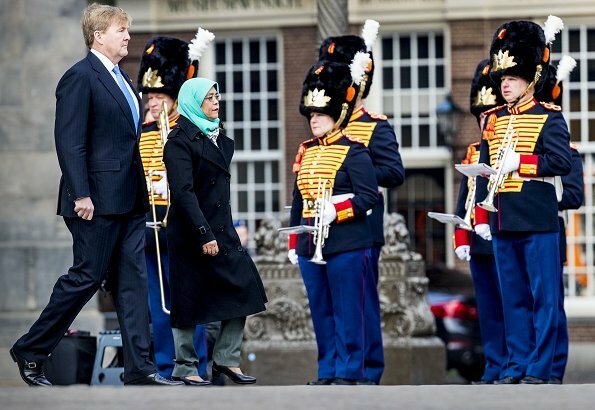 Singapore's President Halimah Yacob made a State visit to the Netherlands on November 21 and 22, 2018 upon the invitation of King Willem-Alexander. Her husband, Mr Mohamed Abdullah Alhabshee accompanied the President during her visit. 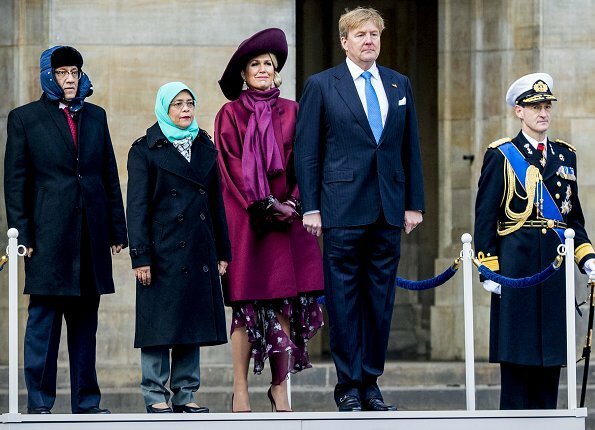 On November 21, 2018, Dutch King Willem-Alexander and Queen Maxima welcomed President Halimah and her husband with an official ceremony at Dam Square in Amsterdam. Afterwards, a reception was held in the Royal Palace in Amsterdam. Odd the president wearing a hat like that on an official state visit. Madame Halimah est la présidente,monsieur n’est que le mari . It is the husband of president Halimah Yacob who wears the hat. The President is a woman. Well regardless of who he is, it's still an odd hat choice. I know it's cold, but still looks too casual. Singapore is on the equator and has 30 degrees Celsius every day of the year (with humidity it feels like 42-45C). So give the gentleman some slack. It's not a weather climate he is used to. Also, Maxima's dress may be a little too thin for this weather, and the hemline is quite dramatic - but certainly it is not a rag. Had it been Letizia, many of the comments would have made a complete 180. It would have been a "fabulous" or "amazing" outfit. To each her own but anyone at all wearing that 'thing' would get a 'no, no, no' from me. She often goes to extremes but this is beyond extreme. The coat should be the same length as the dress; not a good look with that kind of hemline. Pretty colors though. Oh dear, Maxima is down to wearing rags! Ja, das ist Maxima! Heel mooi. Wunderschöne Herbstfarben. Der Hut steht ihr gut. Sie sieht hier einfach super aus. Starting looking from the head down and thought, nice hat and coat, then...oh my a dress below her coat and then an uneven hemline. This is not good at all. an uneven hemline is not the devil, btw. Rather on right now but you need to see the whole dress. Maxi dear, love you but this doesn't work, i like the color, very rich and perfect for this season, the coat is not bad but the dress...😵 maybe for a coktail party..
Not the right coat for that dress but I love colours. If it weren't for the floaty hemline showing it would fine - I like her and scarf with the coat. I'm thinking that their next visit to Europe will be in July, not November. Must be quite the shock for them weather-wise. I would not like the excessive heat in Singapore! Almost everything looks great but that dress really Maxima. Love the color. The best dressed is King Willem-Alexander… and the only one! according to our European standars, maybe, but I am in favour of some open mindness. As usual, Queen Máxima is a fashion diva. 2019 colors and fashion forward hemline. Remember when you see it on others, that Máxima wore it first! Agree with comment about the King being the best dressed. As said elsewhere, Maxima 's outfit would have been fine without the ragged hemline on the dress hanging below the coat. What was she thinking of? Is there no one to say 'Sorry, ma'am. This look doesn't work'' . And no, Anon 1 05, it would not look good on Letizia either.